GIFT BOXES OF … LOVE, JOY, GRATITUDE, CONGRATS AND MORE! At The Art of Simple, we are good at making everyday things simply better. And since we’re known for our unique "wow" items and "curiosities and necessities" we’re taking our art of gift giving to the next level... introducing our new line of custom gift boxes! How does it work? Well, it’s really quite simple. Let us know the occasion, items of interest, price and any other tidbits of knowledge, and we take care of the rest! The finished product is an elegant, neatly packaged gift for your special someone. Be it a birthday gift or a client thank you gift, the act of giving should not be stressful or painful – our wish is for the giver of the gift to be just as happy as the lucky receiver! We like to call it effortless gift giving. What sort of gift box options do you offer? Wooden gift boxes or crates, as well as our signature ORANGE gift boxes. Occasions to give a gift box of happiness: thank you, anniversary, birthday, wedding, welcome gift, get well, mother's day, father's day, graduation, bridal party, honeymoon, house warming, corporate gift, realtor gift, holiday, or JUST BECAUSE. What is the price limit for ordering a gift box? Wooden crate gifts start at $50 and wooden box gifts start at $75. Our signature ORANGE gift boxes are available for a $1.50 -$3 packaging fee (+ gift purchase price), depending on the box size. How much notice does a customer need to give in advance of pick up/delivery? Depending on the gift, as little as 1 hour for a simple gift box done locally. 24-48 hours + shipping for online orders. If a customer requires certain item(s) for a more customized gift where select items need to be purchased in multiple quantities or special needs (i.e., wedding party, corporate gifts), we kindly request a 30-day notice. For last minute or a rush needs, we will do our best to work up some magic! What are some of your more popular gift box requests? WEDDING PARTY GIFTS - whether it's for welcome, bridesmaid or groomsmen, we help create gifts that will flow beautifully with your wedding colors/themes by selecting particular items. REALTOR GIFTS - we understand the impression of a thoughtfully curated client gift. Set a price and we create a custom gift that can be catered to the client. Really seeking that extra attention to detail? 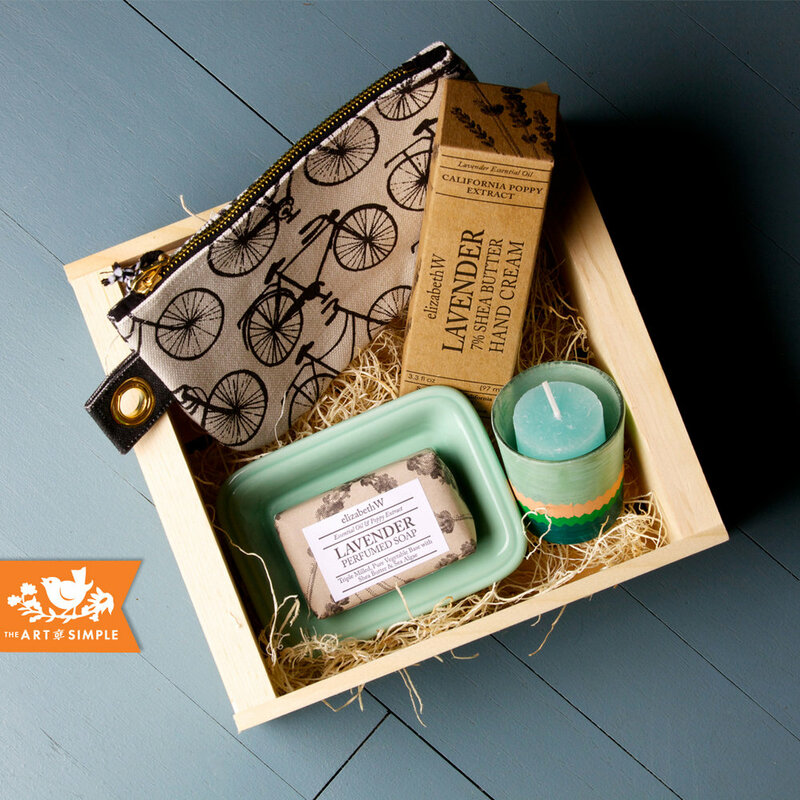 We can create your own branding gift box via a custom rubber stamp with your logo! And with multi-item purchases, we're happy to pass along the cost savings by offering discounted rates.